When I think lo-fi, I think lo-fi sci-fi. I think of games like Alien Isolation, Bioshock, SOMA. Films like Alien and Blade Runner. I think of gritty, chunky sounds. Interfaces or devices that click and clatter and that have been through the ringer more than once. I think what makes lo-fi sci-fi so great is how everything seems to be grounded in some sort of reality. Even these fantastical gadgets emitting lasers or displays we don’t see every day have some sort of feature that connects them to the world. Things have a place and the sounds help compliment that. Especially the case with Alien and Blade Runner, the devices or technology seems to be clunky and cumbersome. They have their use and are great at their task but they seem like they desperately need to be taken out of service and upgraded. One of my approaches to making these kinds of sounds is to ‘worldize’ them. Worldizing is a term and technique developed by Walter Murch in the early 1970’s. This technique takes recorded material and plays it back in a particular space using a tape machine and speaker and then record the result of it interacting with the space. While my approach isn’t, by definition, Murch’s worldizing it is sort of an in the box version of an analog technique. 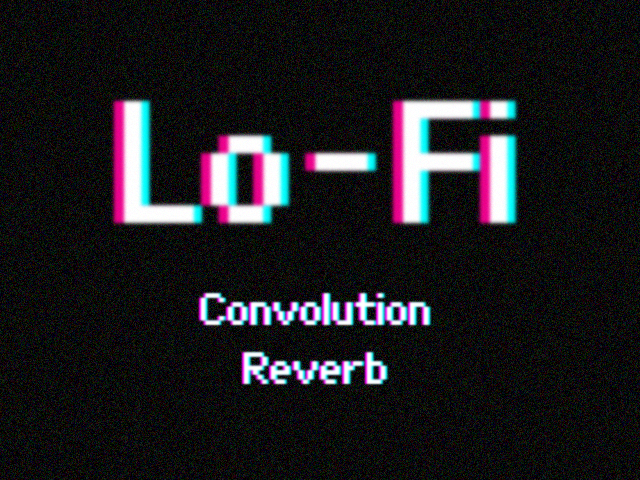 For this I turn to Fog Convolver, a convolution reverb plugin. It applies the character of an impulse response to your sound/input in real time. An impulse response is a recording of the output of a space or device (i.e. speakers, objects etc.) when an impulse is played. While Murch’s worldizing is more focused on spaces, mines more focused on items and devices. It comes with a plethora of responses but it also allows you to import your own. I created a specific category for Lo-Fi of my own recordings. Recording your own responses is super fun. I’ve used my contact mic on a few items to get a nice response i.e. the acrylic tub and the Gameboy. In both instances of speaker impulse recordings I generally play a click through the speakers and record the output. To get it even crunchier I suggest using a beat up mic like an SM57. For optimal crunch record that mic into a tape recorder and then record the output of the tape. With Fog Convolver you can blend wet and dry, change pitch, determine start and end time of the sample etc etc. The amount of control is great for really dialing in that sound. For things like speakers I like to have things at 100% wet and no dry signal, seems to sound the best. For things like footsteps or the like I usually blend the two to taste. 100% wet signals tend to make them sound like they are in another room, which is useful. It all depends on the context. 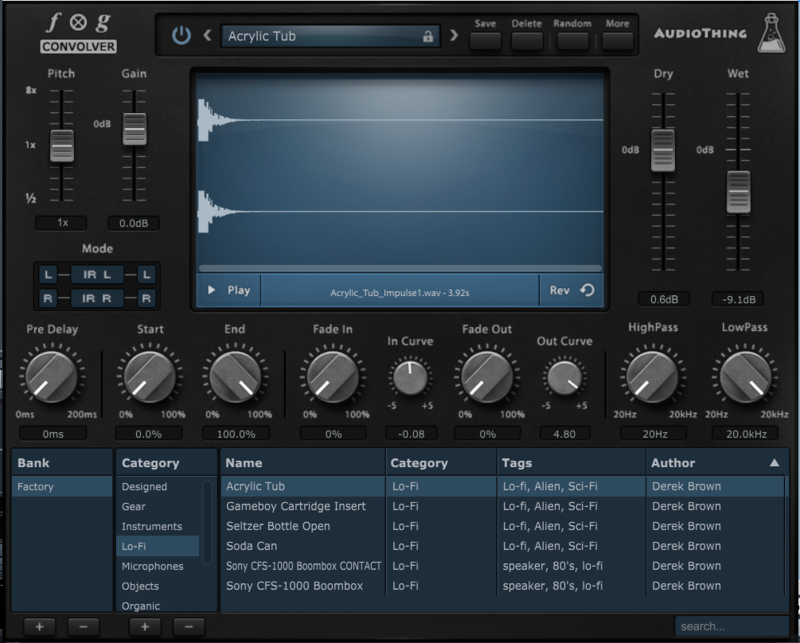 In my examples I have the dry sound at the beginning and then the same sample with FX applied. This one uses a IR of me tapping the Gameboy itself and captured through a contact mic. It gives the buttons a sense of being from a specific device. You could blend the two signals to taste more than I did here but you get the idea. This last example is the most obvious. I wrote this song a while back, throwing it through Fog Convolver really sells it. The IR used is stock from Fog Convolver and its captured from a Gameboy speaker. I think this is a great way to fit your sounds into the world of your project and really sell the experience. Custom IR’s are really fun to record and it’s a fun experiment to find ones that work and ones that don’t. Test em all out! 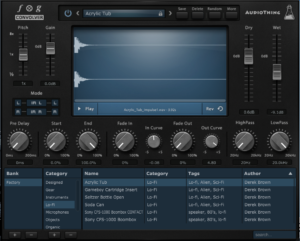 Great intro article to convo reverb! Out of curiosity, what contact mic are you using? Glad you enjoyed it Erik! I’m actually using a contact mic that I built. It isn’t pretty but it gets the job done!